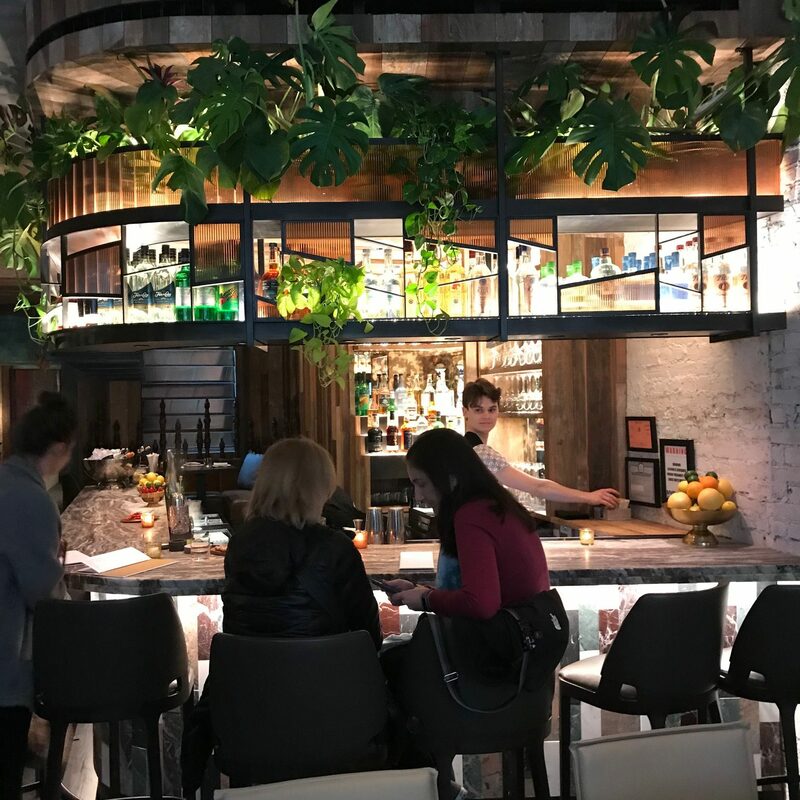 Best new restaurant in New York City. 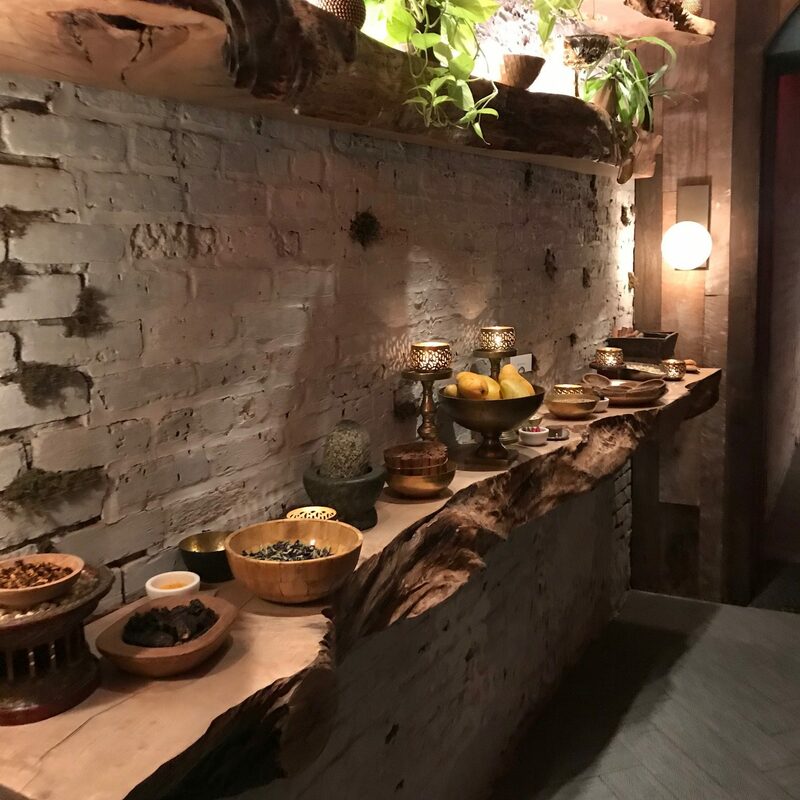 First of all, the owners have transformed the former Bread restaurant in Nolita…it’s beautiful, intimate, atmospheric as well as welcoming, highlighted by carved woods and warm lighting. A bar and small tables are up front. 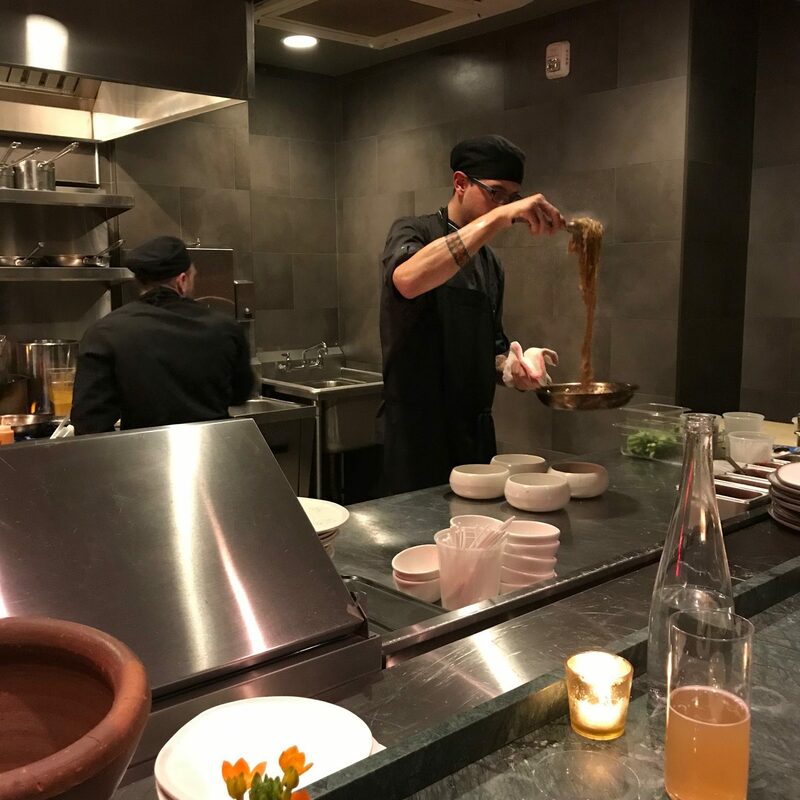 A narrow passage winds past the chef’s counter to a seductively lit dining room. Jean-Georges’ son, Cedric Vongerichten, and his wife have created an aesthetically pleasing home in conjunction with delectable fusion cuisine. We had a reservation, but opted for the chef’s counter to watch the action rather than sitting in the dining room. I recognized Chef who went out of his way to engage and sent over some sumptuous dishes. He also introduced us to his charming wife, Ochi Latjuba Vongerichten. They met at the Culinary Institute Of America and she is a major player in their new venture. The wine and beer selections compliment the well seasoned food. 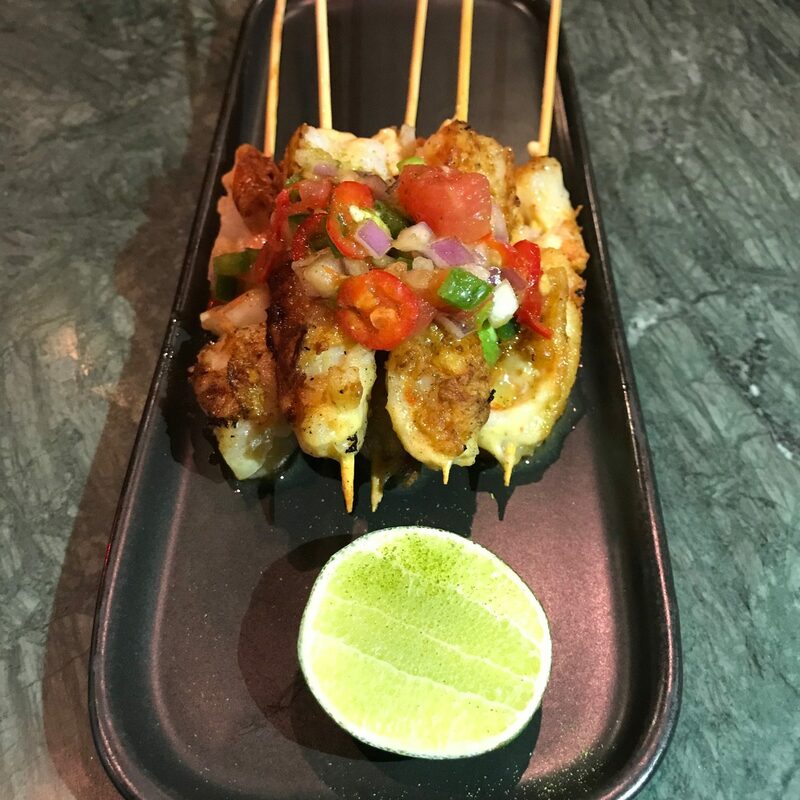 We started with excellent Shrimp Satay perfectly seasoned ($15). 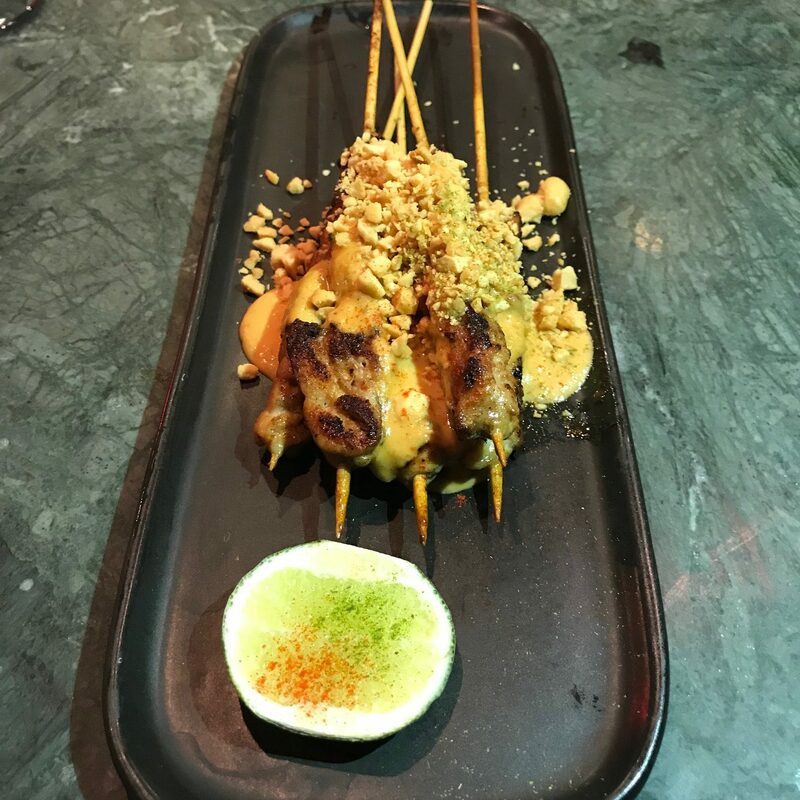 Chef sent over Chicken Satay accompanied by a lovely peanut sauce. 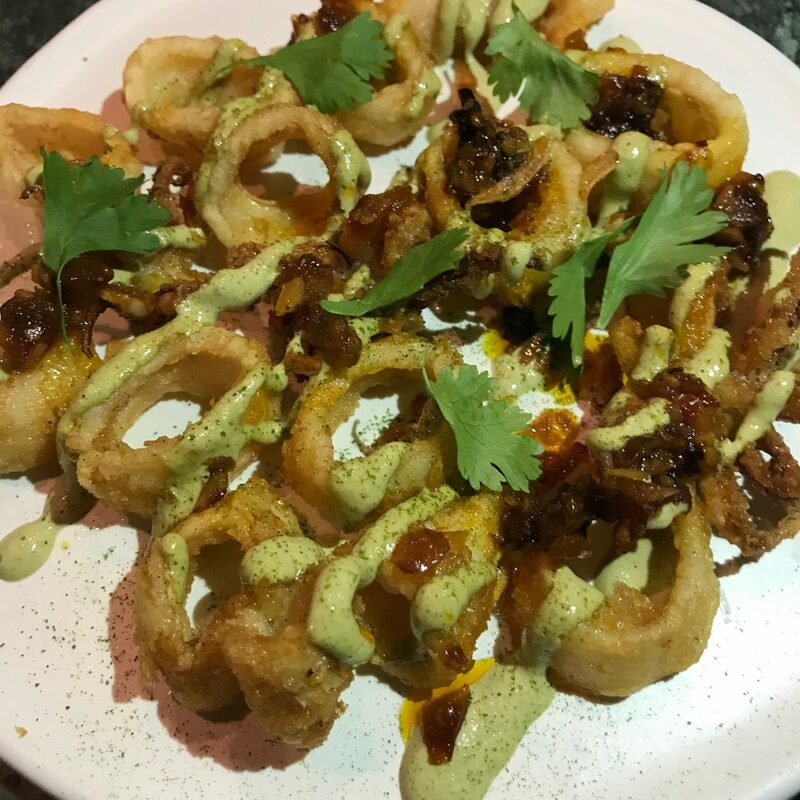 The Crispy Baby Squid with sambal onion chili sauce and cilantro was deliciously crispy with a bit of heat ($15). A real highlight was the Avocado Gado Gado. The salad is traditionally a mixture of potato, vegetables, and egg in a peanut sauce dressing. 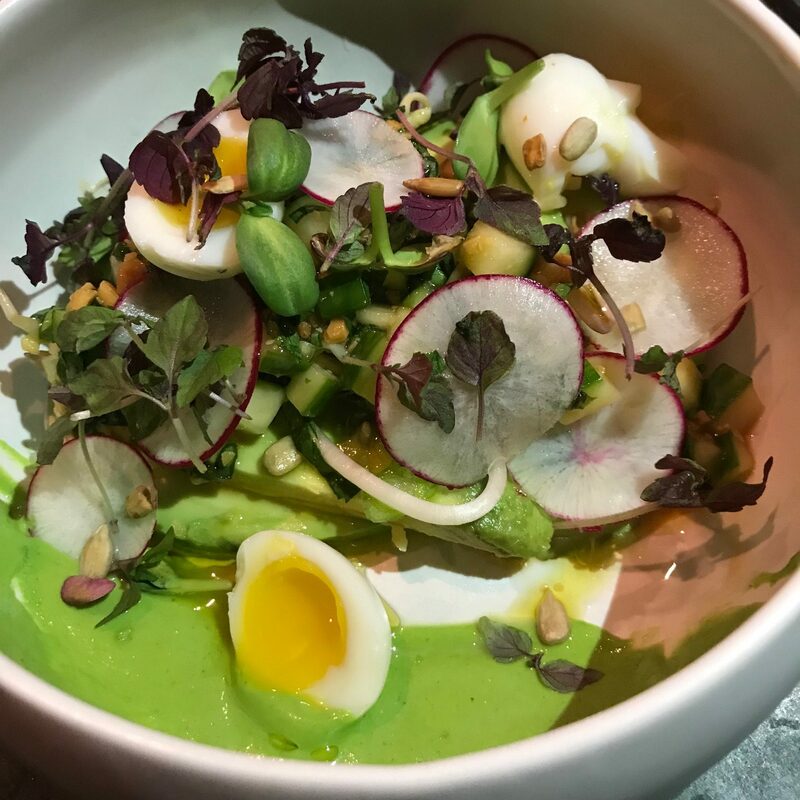 Here it comes with avocado, quail egg, cucumber and peanut relish ($14). Interestly, we learned that the avocado is eaten as dessert in Indonesia. 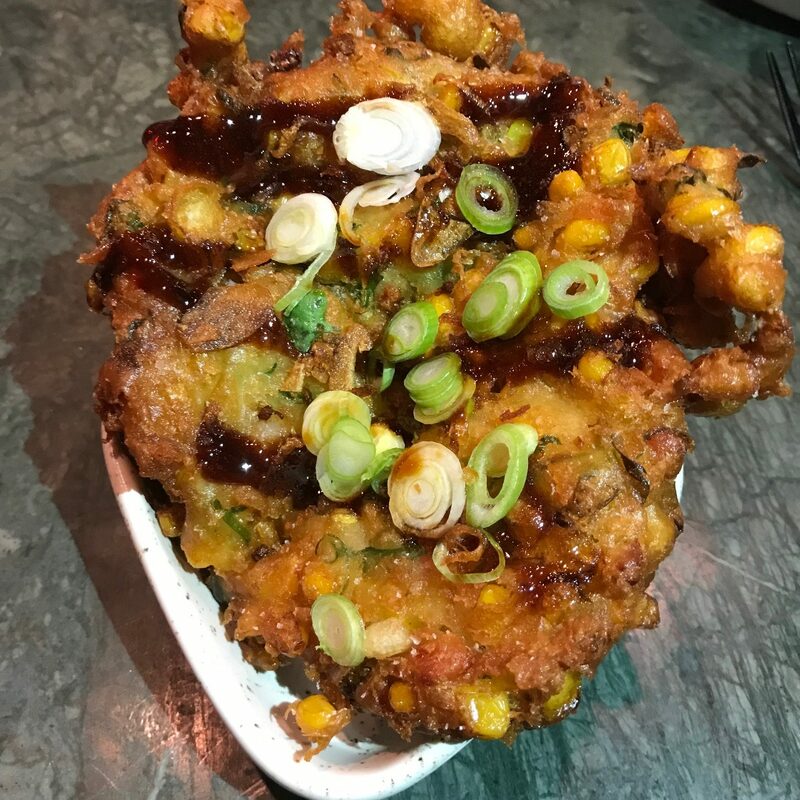 The crispy Indonesian Corn Fritters (Bakwan Jagung), are addictive and intoxicating. The Lobster Noodle with black sesame, recap manis (Indonesian sweet soy sauce) and thai basil is beyond fabulous. 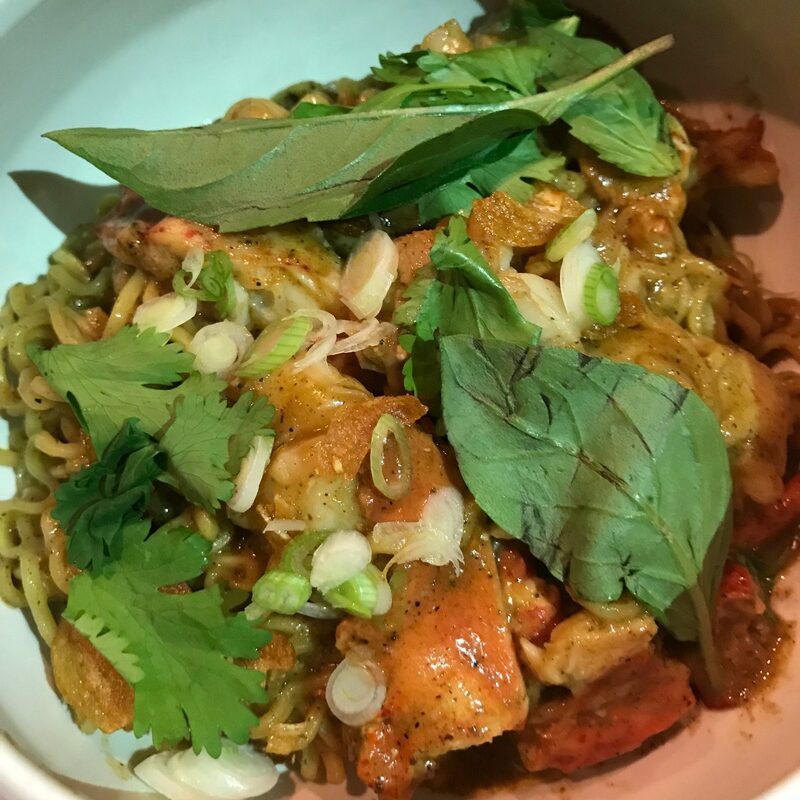 The noodles sweet and prepared perfectly, the lobster plump and firm with a dash of spice ($29). 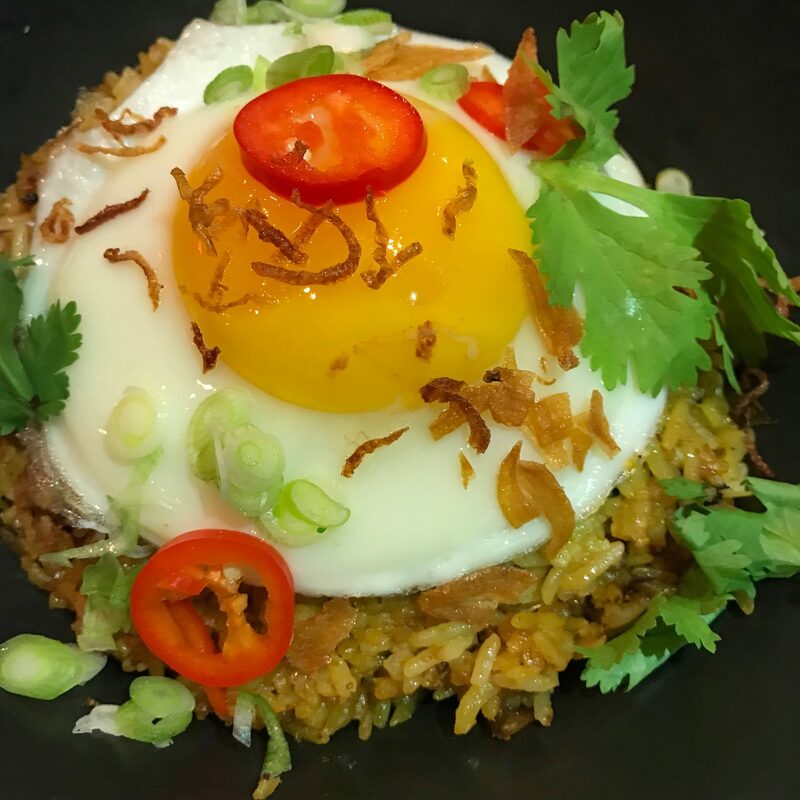 The Nasi Goreng (fried rice) with scallion, fried onions and a runny egg was a delectable side dish ($16). We were satiated, but tried a dessert and chef sent one over. I must say they were two of my all time favorite desserts. 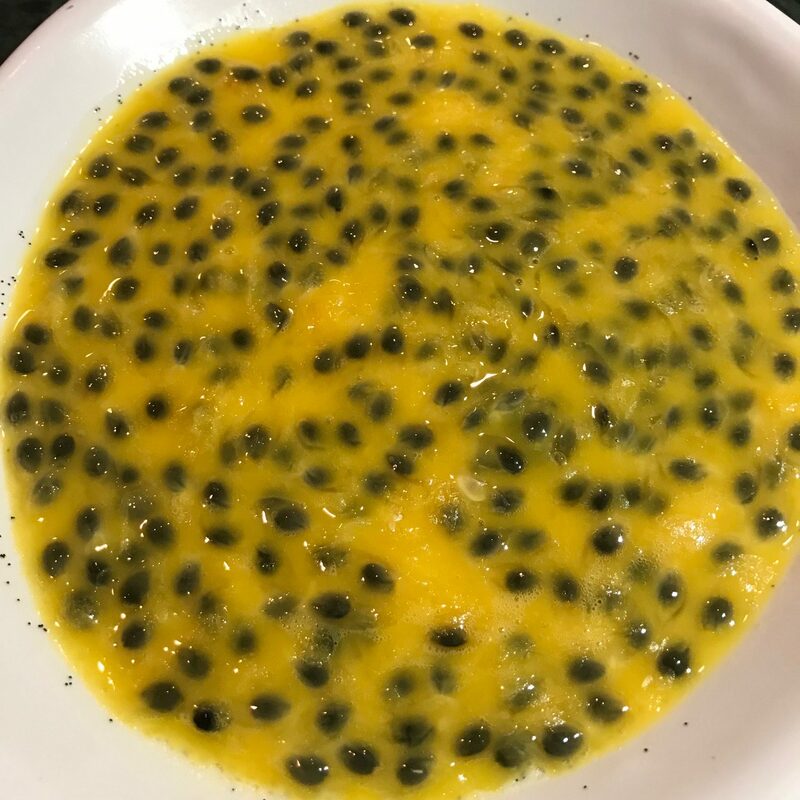 Pandan Custard ($12) with a lava floe of tart fresh passion fruit is one of the best things on the menu and you shouldn’t miss it. 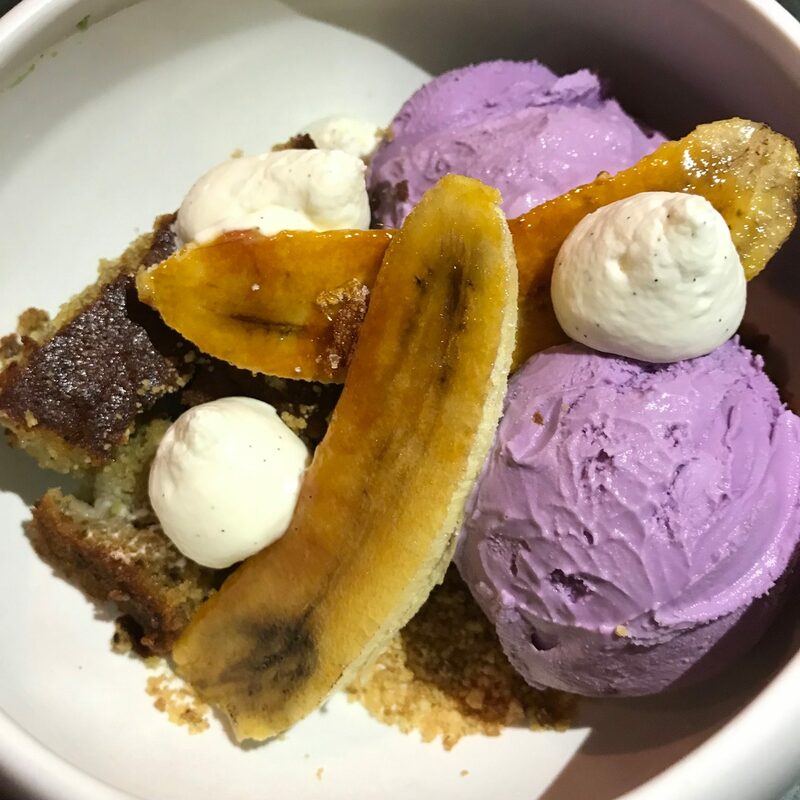 The Carmelized Banana Sundae was incredible, the sweet potato (ube) ice cream a real highlight ($12). Background on the name…In Balinese culture, each person receives one of four names based on birth order. 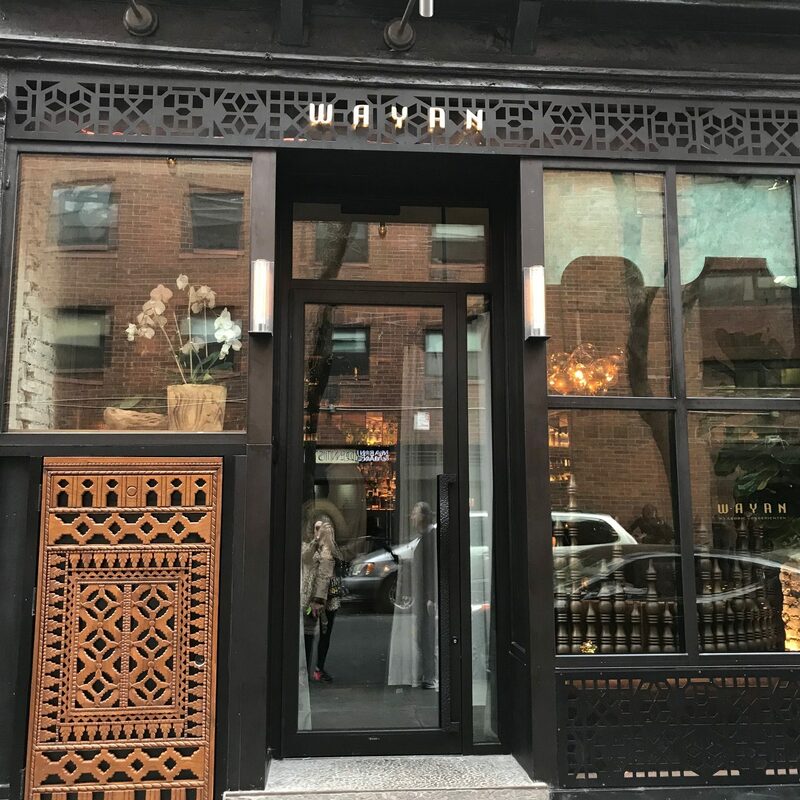 Wayan is the name given to the first-born child or, in this case, to the chef’s first independent culinary effort. 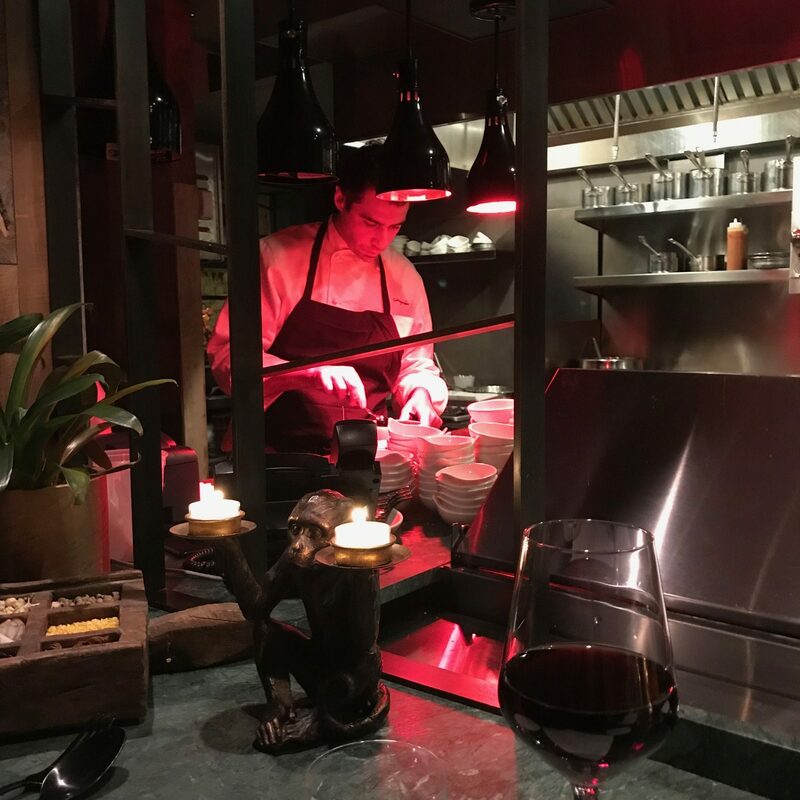 Chef Vongerichten is best known for being executive chef at his father’s restaurant, Perry Street, where he still reigns over the kitchen. With Wayan, he has cast his own stellar, independent reputation. 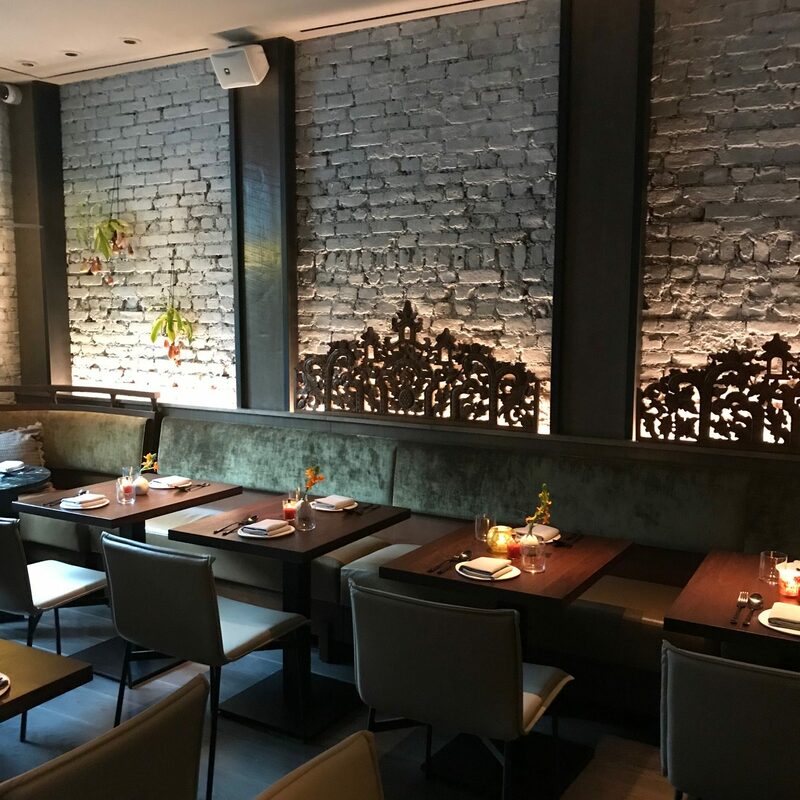 Wayan is a lovely escape into a world of appealing ambiance and deliciousness. Wayan 20 Spring Street New York City. Open for dinner Monday, 5:30-10:30 pm, Tuesday-Thursday, 5:30-11 pm, Friday & Saturday, 5:30 pm-12, Sunday, 5:30-10 pm. Reservations on Resy.